Here is our contribution to Apologetics315's series called How to Get Apologetics in your Church. I encourage readers to check out all the essays in this series! Many thanks goes out to Brian for the opportunity to contribute. On October 10th, 2010, Faith Christian Fellowship and Truthbomb Apologetics will welcome Dr. Frank Turek of CrossExamined Ministries to speak on the topic of I Don't Have Enough Faith to be an Atheist. He will be speaking at 9:00 am and 10:30 am. "Dr. Frank Turek is a dynamic speaker and award-winning author or coauthor of three books: I Don’t have Enough Faith to be an Atheist, Correct, Not Politically Correct and Legislating Morality. As the President of CrossExamined.org, Frank impacts young and old alike at colleges, high schools and churches with hard yet entertaining evidence for Christianity. He hosts a hour long TV program each week called I Don't Have Enough Faith to Be an Atheist that is broadcast Wednesday nights at 9pm and 1am Eastern on DirecTV Channel 378 (the NRB Network). His radio program called CrossExamined with Frank Turek airs on 136 stations every Saturday morning at 10 a.m. eastern. Frank also writes a column for Townhall.com and has appeared on many TV and radio programs including: The O’Reilly Factor, Hannity and Colmes, Faith under Fire, Politically Incorrect, The Bible Answerman, and Focus on the Family. He has debated atheist Christopher Hitchens twice. A former Aviator in the U.S. Navy, Frank has a Masters from George Washington University and a Doctorate in Apologetics from Southern Evangelical Seminary. To help reverse the exodus of young people from the Christian faith, Frank conducts dynamic I Don’t Have Enough Faith to be an Atheist outreach events on campus. At these events, Frank presents the evidence for Christianity, cross-examines arguments against it, and answers student questions." So, invite your skeptical friends and be there to hear Dr. Turek! 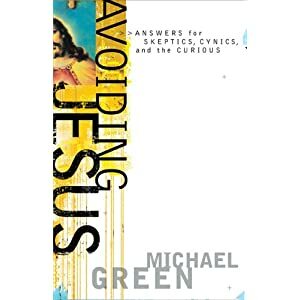 We have been asked by Apologetics315 to contribute an essay to a series that will eventually be turned into an e-book and be made available in podcast form. 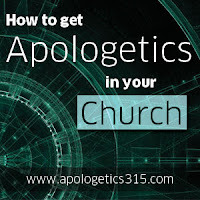 "During the month of September 2010, Apologetics 315 will feature a series of blog posts that respond to the question: "How can I get apologetics in my church?" The goal of this project is a simple one: to share stories, experiences, and advice that will help Christians to start their own local apologetics initiatives. Whether you be a pastor, youth pastor, teacher, elder, or lay person, this series of short essays could hold the keys you need to get things started in your own local congregation." We are grateful to Brian for the opportunity and don't forget to pray about this project! The blogosphere and the mainstream media has had much to say about Stephen Hawking's recent comments about his forth coming book The Grand Design. Personally, I would like to ask how something can come from nothing. If we are speaking of "nothing," in the correct philosophical sense, then how could the law of gravity be included in the so-called "spontaneous creation" of the universe. That would be something rather than nothing. Regardless, the media is celebrating Hawking's forthcoming release; however, as mathematician John Lennox points out in this article, Hawking's claims are nothing new. If you have read the Gospels, you may well have been struck by a remarkable contrast. On the one hand, Jesus is a humble, self-forgetful figure, healing the sick, teaching the people, befriending the outcast. He is no academic theologian but a carpenter with calloused hands, whose words are full of hardheaded wisdom and and earthly illustrations. He has no money, no settled home, no vote, no rights. On the other hand, he makes the most fantastic claims, and many of them are almost casual, offhand remarks. For example, he takes it for granted that he is entitled to man's worship, the worship due to God alone. When Peter falls at his feet in adoration after a fishing expedition and says, "Depart from me, for I am a sinful man, O Lord" (Luke 5:8), Jesus does nothing to stop him. When Thomas falls at his feet after the resurrection and exclaims, "My Lord and my God!" (John 20:28), Jesus does not rebuke him-except for needing the evidence of his eyes to come to that conclusion. No good person would do that. Indeed, we have examples in the New Testament of two good men, Peter and Paul, who found themselves being worshiped by ignorant pagans, and they reacted violently against it, telling them to worship God alone. Jesus seems to have accepted such worship as his due. Watch him deal with a woman accused of adultery (see John 8:1-11) or a man sick with paralysis (see Mark 2:1-12). In both instances, Jesus forgave their sins, and in the case of the paralytic, he gave a visual demonstration of the fact- the man got up at Jesus' command and walked! Not what are we to make of a claim like that? The Pharisees knew very well what to make of it. "Who is this that forgives sins?" they asked. "There is one who forgives sins, God." That is precisely the point. Jesus was laying implicit claim to do what God does, to forgive people their sins. Indeed, when Mary is told that her baby must be called Jesus, the explanation of the name is brought out like this: "for he will save his people from their sins" (Matt. 1:21). In the Old Testament (Ps. 130:8, the authority to forgive sins is solely, and naturally, said to belong to God alone. Here, right at the start of his life, Jesus takes on the job. The implication is obvious. In Jesus we meet someone who is different. What are we to make of this? C.S. Lewis puts the challenge with his customary force. "There is no hallway house, and there is no parallel in other religions. If you had gone to Buddha and asked him: "Are you the son of Bramah?" he would have said, "My son, you are still in the vale of illusion." If you had gone to Socrates and asked, "Are you Zeus?" he would have laughed at you. If you had gone to Mohammed and asked, "Are you Allah?" he would first have rent his clothes and then cut off your head. If you had asked Confucius, "Are you heaven?" I think he would probably have replied, "Remarks which are not in accordance with nature are in bad taste." This man was different. He was not merely a great teacher. "The things he says are very different from what any other teacher has said. Others say, "This is the truth about the universe. This is the way you ought to go." But he says, "I am the Truth and the Way and the Life." He says, "No man can reach absolute reality, except through me. Try to retain your own life and you will inevitably be ruined. Give yourself away and you will be saved." He says, "If you are ashamed of me, if, when you hear my call, you turn the other way, I will look the other way when I come again as God without disguise. If anything whatever is keeping you from God and from me, whatever it is, cut it off. If you put yourself first you will be last. Come to me, everyone who is carrying a heavy load, and I will set that right. Your sins, all of them, are wiped out. I can do that. I am Re-birth, I am Life. Eat me, drink me, I am your food. And finally, do not be afraid, I have overcome the whole universe." That is the issue." Yes, that is the issue. What are you going to make of it? Note to Readers- I was impressed with the broad scope of popular objections this book addressed from a philosophical and theological perspective. This would be a great resource to give someone who is beginning to ask questions about the validity of the Christian Worldview. I would highly recommend this book as an evangelism tool!